When I went to Kassel, Documenta 13, 2012, I was most impressed by Tino Sehgal’s This Variation. The work took place in a very dark room. As I walked in, I could not see a thing, but I was drawn by some very attractive sounds. At first, a sound like a cooing dove, then, foot-tapping, shoe-squeaking, someone breathing heavily, unn-huh, unn-huh, then a rhythm beginning to unfold like a familiar pop song. In the dark, some shadowy figures were crawling towards me. They seemed to try to grab my feet. I was a bit scared. I wanted to move back, but more people were coming behind me. Who was there? Where were the other visitors I had seen going in before me? The blackness had swallowed us whole. Five minutes later, I was making my way through the room, eyes adjusting to the gloom. I could see someone out there. Were they performers or spectators? They must have seen how I took my first step into the darkness, my hesitation and fear. More people joined to sing, dance, or crawl on the floor. It looked more like a disco place to me. “How did we get this far apa-aart?” Suddenly, someone shouted. This Variation left me breathless and overwhelmed. The work is about visibility. My experience in the dark room might be summarized as: I cannot see, I am seen, I see I am seen, I see. It emphasizes the essential, but often ignored, necessity of light for all vision. This work reminds me of Jeremy Bentham’s panopticon. As a work of architecture, the panopticon is a model of a prison. The building structure allows a watchman to observe occupants from the central tower, without the occupants knowing whether or not they are being watched. This Variation was later shown at the Ullens Center for Contemporary Art in Beijing in 2014. The relevance of the work with the central tower concept seems even clearer. A photo snatched by someone’s iPhone at the exhibition site appeared on Chinese social network We Chat. Almost at the same time, a picture of smoggy day captured by a Chinese newspaper became viral. In that picture, the only spot of light is an advertisement for a dumpling restaurant. The similarity of the darkness between the two pictures is so obvious. This Variation has varied meaning in Beijing. It could particularly reflect on the environmental, social and political issues in China, such as the smoggy weather, and tight internet censorship. Despite the fast growing economic and rather stable socio-political environment, Internet censorship in China has become more intense in recent years. Many websites connected with the outside world are blocked. More and more contemporary Chinese artists have become aware of the situation, and have used their work to challenge the edge of visibility. Sui Jianguo’s Restrained Power is a huge black box placed in a darkened room. 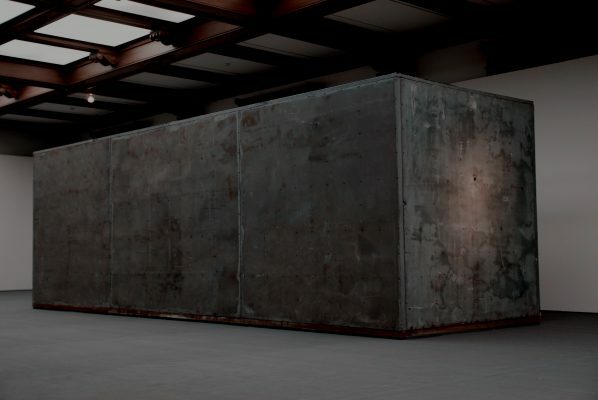 People can hear the big collisions within the box from time to time, without knowing what is happening inside. Looking through a small hole, the viewers may catch glimpses of huge steel balls rolling and colliding. According to the artist, Restrained Power was created in order to express feelings of “imprisonment”. 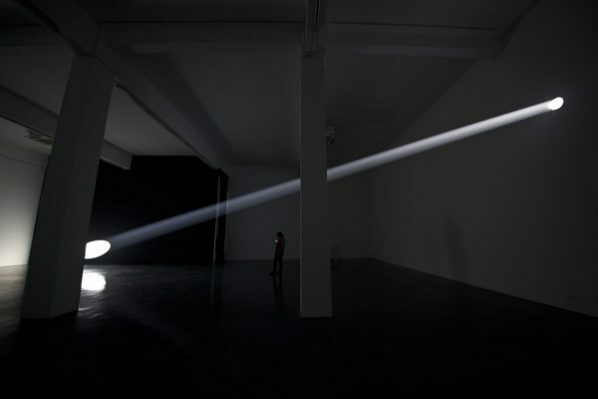 As if seen inside Sui Jianguo’s black box, Zhan Wang’s Traceless is installed in a dark room. Crossing through the darkness, a beam of light captures dust, making the invisible visible. Was it the PM 2.5 which caused China’s smoggy weather? The work forces us to be aware of the physical actuality of the space we are living in, as well as the unseen power which controls what we can see. Xu Bing’s ongoing work, Dragonfly Eyes, exactly reflect everyday life in China. Instead of camera operators and on-screen actors, the film uses publicly available video surveillance from everywhere across China. Dragonfly Eyes is obviously a metaphor. It constructs a narrative from seemingly unrelated fragments of reality to reveal what cannot be seen by the naked eye. Inspired by the American film, The Truman Show, and George Orwel’s dystopian novel 1984, Xu Bing’s work reminds us that we are being watched all the time. 1 Foucault, Michel. Discipline and Punish: The Birth of the Prison. Trans. Alan Sheridan. New York: Vintage, 1977. Discipline & Punish pp 200-201. Bridge Gallery presents "Liu Xuguang: Prime Field"